Driveway Cleaning & Restoration - Whatever the surface! The Vast majority of The enquiries that we receive from residents in The East Yorkshire area are for driveway restoration. The Inside story of Driveway Restoration. The majority of our enquiries are for driveway restoration.We offer a range of specialist outdoor cleaning services including many types of hard surfaces such as Imprinted Concrete, Block Paving, Crazy Paving and Tarmac. Our services are designed to give your driveway and block paving that 'just laid' look once more. Any exterior surface that is exposed to the elements is always vulnerable to colour loss and surface growth, such as moss, algae and weeds. 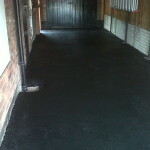 We can offer you a service to remove this grime and restore your driveway to its former glory. The fungicidal cleaners that we use will eradicate any surface infestation and our powerful NEW & INNOVATIVE pressure washing equipment will allow any dirt and stains to be washed away with ease. Once dry, we would recommend that the area is then treated with 2-3 applications of protective coating, to provide a non-permeable membrane across the surface, reducing the need for regular cleaning and maintenance. 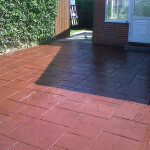 We can also provide colour tints if required to enhance the paving to its full potential.